RadialGaugeNeedle is a scale indicator that points to a value. 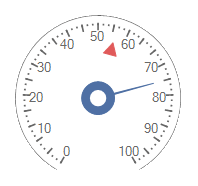 To add a needle to the gauge, you should add it via the RadradialGauge. Items collection. Value - specifies the needle's value. 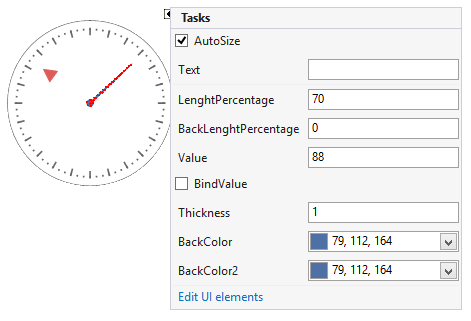 Thickness: Controls how thick the needle will be rendered. PointRadiusPercentage: Specifies the outer radius of the needle's start point. InnerPointRadiusPercentage: Specifies the inner radius of the needle's start point. 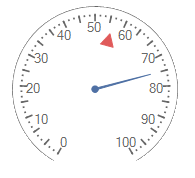 LenghtPercentage: Controls how long the needle will be rendered. BackLenghtPercentage: The value with which the needle juts out from the center point. BindValue: Indicates whether the needle's value is bound to the gauge's Value. 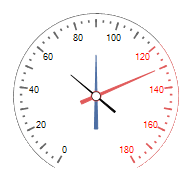 BindOffset: Specifies the value offset of the needle according to the gauge's value. The ValueChanged event fires when the needle's value is modified.